For: Lovers of the fae, high fantasy and a love worth fighting for. Book Synopsis: When nineteen-year-old huntress Feyre kills a wolf in the woods, a beast-like creature arrives to demand retribution for it. Dragged to a treacherous magical land she only knows about from legends, Feyre discovers that her captor is not an animal, but Tamlin—one of the lethal, immortal faeries who once ruled their world. My review: Wow. Where do I begin? I only put this book down to go to work and that was purely because I had no choice in the matter. 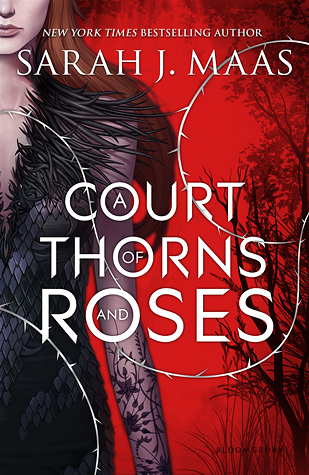 A Court of Thorns and Roses was absolutely superb! ACOTAR as it is affectionately being called is a coming of age story with a good kick in the teeth for good measure. It follows the story of Feyre – a huntress who hunts to keep her family alive after she promised her dying mother that she would look after them. Feyre is an average 19 year old human girl – only the world she lives in is not so average. Prythian is a land plagued by Fae and not always the nice kind – as is typical there is both Light and Dark fae though occasionally the line between the two blur and they blur so well – after a human vs Fae war that decimated much of the human and fae population and the land of Prythian, there are many humans with a hatred for fae but also the fanatics – Children of the Blessed – who love them. ACOTAR opens with Feyre hunting in a wood plagued by winter frost, she spies a doe foraging for food in the frost before becoming aware of a wolf hunting the doe – at first she tries not to kill the doe but instead kills the wolf after it attacked the doe. This killing of the wolf sets into motion a chain of events that completely change Feyre’s life; the wolf was a faerie and she murdered him in cold blood. From that moment, Feyre knows that she is likely to be found out by the fae and is scared – to be fair I don’t blame her. A few days later, a larger wolf comes to her house and takes her away to live beyond the wall, from then it’s a story of finding out what is going wrong with the fae, how it will affect her life and the lives of everyone around her and – what surprised me – falling love. Dead–really, truly, I should have been dead for that. I occasionally feel that YA romance/love scenes are written too sparingly (if that’s a good or a bad thing, I’m not sure) I just don’t feel like there is anything there, no connection. But the connection between Feyre and Tamlin is in the forefront of the majority of the story – considering that he lets her leave after saying she could never leave and her going Under the Mountain and nearly dying to try and save him. Overall, ACOTAR was just brilliant; I couldn’t find any faults other than I have to wait for the next book and I’m concerned that there may be a love triangle in the books to follow – I’m not entirely sure I want one. The dialogue was balanced perfectly with the rest of the book and I just wanted to be in the Spring Court so bad. It’s really hard to review a new book without giving away too much or anything, I want people to read the book but I also want to tell people everything that happens and give them spoilers galore.